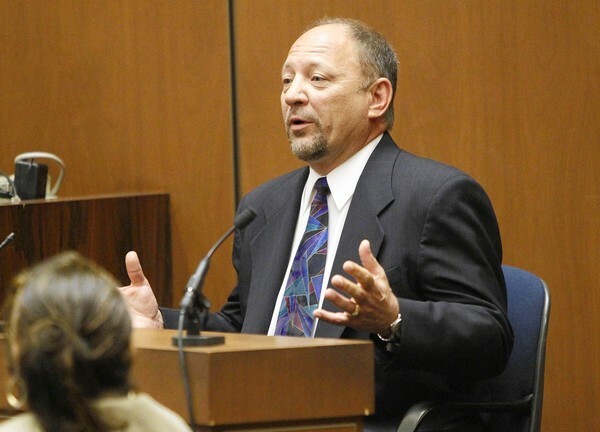 Yesterday, the last witness was #6, Kai Chase, Michael Jackson's personal chef. She testified much the same as she did in the preliminary hearing. Prosecution is showing the witness a pulse oximeter sensor and circuitry all in one that can be worn on the finger, Model #9500. The witness states it does not have an audible alarm. Johnson testifies that this model is designed for spot checking vital signs. It's not designed for continuous monitoring. The product manual/description included with the product is specifically labeled against that. Labeled against continuous monitoring in the warnings. Does come with instructions for use. This device has no audible alarms and is designed for spot checking. "Taking an instantaneous reading." Warning quote in package materials. The retail cost: $275.00. Mr. Johnson also testified about another model of pulse oximeter, the Nonin 2500A. Prosecution: What type of pulse oximeter is that? RJ: It is a pulse-oximeter that displays the same functions but also has visual and audible alarms. Prosecution: Is that an alarm that is designed to be heard in another room? Prosecution: It can be heard outside of a bedroom? RJ: It is loud. And annoying. Prosecution: In 2009 how much did that product cost? RJ: It would be about $750.00 retail. Next up was #9, Richard Senneff, Los Angeles Fire Department Paramedic, first on the scene. Testimony basically the same as during the preliminary hearing. Senneff testified that Jackson's skin was cool to the touch and his pupils fixed and dilated. During the paramedics treatment of Jackson at the scene, Senneff testified he was never able to feel a pulse or see a heart beat on the monitors. Dr. Murray did not not tell him that he had administered propofol to Jackson. Following Senneff was #10, Martin Blount, fifth paramedic to enter the residence and care for Michael Jackson. Testimony basically the same as during the preliminary hearing. Blount never heard Dr. Murray mention the drug propofol. Last witness of the day on Friday was #11, Dr. Richelle Cooper, UCLA ER physician who paramedics consulted with over the radio. Pronounced Jackson dead over the radio, and a second time when he was wheeled into the ER. 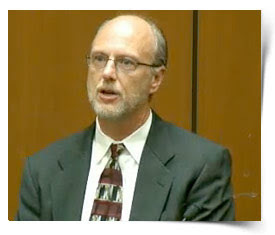 Dr. Cooper was still on the stand at the close of the court day. What are your thoughts on the prosecution's case so far? DDA Deborah Brazil, co-prosecutor on the Murray case. Nareg Gourjian, one of three defense attorneys representing Dr. Murray. I've been watching a bit of the Conrad Murray Trial. I listened to opening statements, saw a bit of testimony on Tuesday, listened to some talking heads commentary yesterday and I've listened to some of Alberto Alvarez on the stand today. So far for me, there has been very little difference in the prosecution's case from what I heard at the preliminary hearing back in January. The only startling information came in via the prosecution's opening statement with that tape recording of a clearly out-of-it Michael Jackson. The only additional witness (compared to the prelim) so far has been Paul Gongaware, AEG CEO who testified about how many concert dates there were, when they were added and how quickly they sold out. What are your thoughts on the trial so far? Was there any information that was new to you beyond what we learned at the preliminary hearing? For me, it was nice to see Judge Pastor's clerk, Mrs. Benson and his long-time court reporter, Mavis on camera. They are both lovely people. The next pretrial hearing is December 2nd, 2011. Sprocket. 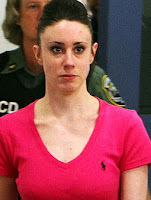 The Associated Press is reporting that the Stephanie Lazarus case has been postponed until January, 2012. 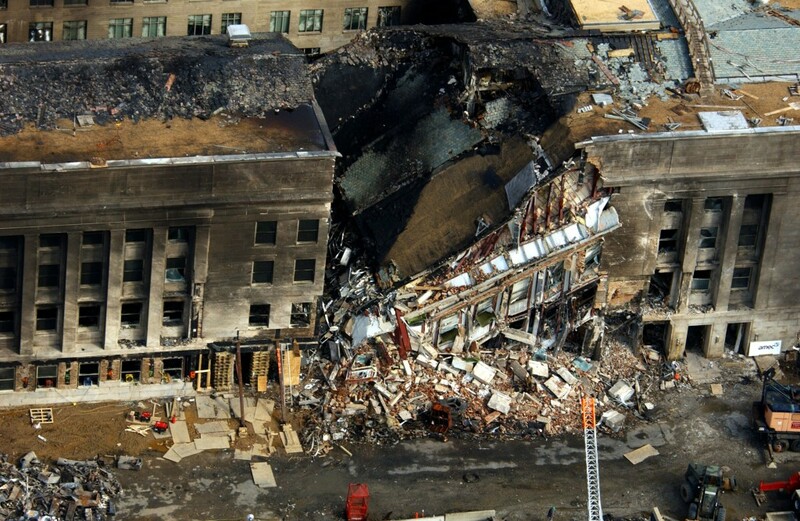 Jury selection was originally slated to start October 24th, 2011. This is what happens when I totally miss a hearing. As soon as I know when the next pretrial hearing is scheduled, I will update this entry. Lazarus is accused of murdering Sherri Rae Rasmussen, the wife of John Ruetten, Lazarus' ex-boyfriend, in February, 1986. Prosecutors allege DNA evidence collected off of the victim's body and torn fingernails found at the scene link Lazarus to the murder. I am so behind in my real life responsibilities and sewing, I decided to make it easy on myself and combine the coverage of three cases. Sprocket. As I clear the first floor security checkpoint, I see Mark Overland and his daughter Courtney Overland in the lobby and heading for the elevator bay. On the 9th floor, I see that Lazarus' mother is here by herself. There's an older couple with gray hair sitting in the second row. The man is reading a paper and the woman is working on a crossword puzzle. It's a good bet that they are here for the case that's currently in Judge Perry's courtroom. One of the detectives comes over to speak to Sherri Rae Rasmussen's mother, Loretta, who is sitting directly in front of me along with her husband, Nels. He tells her he is going to be in her neck of the woods soon and Loretta tells him to call her later. As I'm sitting behind Nels and Loretta, it's hard not to overhear snatches of their conversation. I don't quite grasp all of it. All I hear is, "They found out where she purchased...." and a reply, "Sounds like it." Usually, Nels and Loretta write each other notes back and forth on a little notepad, so this is a rare time that I hear something. Jane Robson from the DA's office is here. Both parties go back into Judge Perry's chambers for an incamera discussion off the record. I squint and finally can read the first name on the court clerk's plackard. It's Melody. Melody is on the phone with a juror from the current case in Perry's court. From hearing half of the conversation, it appears the juror is feeling ill and feels she can't continue. Melody is telling her Judge Perry has asked that she come into court so she can be excused. She's in the parking lot, but reluctant to come in. She doesn't want to be embarrassed in front of her fellow jurors. Melody keeps assuring her that it's just a formality and that it won't happen in front of her fellow jurors. Lazarus is brought into the courtroom. She's not wearing her glasses but she does have some type of cloth bag with something in it. I try to note the time on the wall clock behind me but it's wrong. It's about 50 minutes or so slow. Lazarus turns and gives her mother a big smile. There's something different about her hair but I can't pinpoint what it is. She has the long white thermal undershirt on under her orange jumpsuit. Dateline isn't here. Neither is Greg from CBS. The defense investigator arrives and sits with Lazarus. He tells the clerk Melody, "I have something for you." Jurors for the current case file in and head to the jury room. Presby and Nunez exit from Judge Perry's chambers along with Courtney Overland, but she quickly goes back in after retrieving something from her files. I believe Presby give some motion papers to Melody. Courtney and Mark come back into the courtroom from Perry's chambers. Judge Perry takes the bench. "All parties present. (snip) We were in chambers chatting about some matters, part of discover and the investigation still ongoing. We're not going to start the jury questionnaire on the 17th. (October). 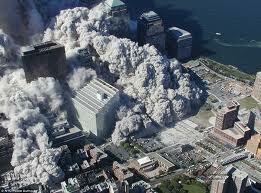 The court hopes to start the trial on October 24th." Judge Perry also states he's not confident that is going to happen. All parties will be ordered back on September 28th to check on trial readiness and other issues. Judge Perry mentions something I don't quite hear right. It's a defense "fictitious?" or "pitches?" motion that he is inclined to accept regarding Renay Brawning (sp?). Judge Perry states both sides are not ready to go to trial on Onctober 17th. Judge Perry asks Lazarus about waiving her speedy trial rights and to set the trial calendar as 0-10 on October 24th. "Yes, your honor," Lazarus replies. Judge Perry states he's ready to rule on the defense firearm motion regarding the "firearm transaction records." (I believe the records that document when Lazarus purchased the weapon she later reported stolen from her vehicle.). "I don't think it's a protected statement. It's not a violation. Motion denied," Perry rules. Overland asks if at the Sept. 28th hearing they can talk about the jury questionnaire. "I know the court eliminated some questions..."
And that's all. It's over pretty quickly. I ride down the elevator with Shannon Presby to ask him about the "fictitious" motion and he explains to that it's a "Pitchess Motion." This is where the defense asks to access a police officer's personnel records for potential negative information. The records are reviewed by the Judge and if there is anything relevant in the file, the defense gets to see it. I get all the way outside the building when I realize that there was a Conrad Murray hearing today and I could drop in and see if anything interesting is being ruled on. I believe Gourjian is telling Judge Pastor that the attorney that is handling a specific issue is his co-counsel Mr. Flanagan, who has all documents related to it. Judge Pastor tells the defense that he wants (everyone?) "...to come back Tuesday or Wednesday and we'll add all the people concerning (to be excused) for cause..."
My notes are not clear, but I believe it's Walgren who asks Judge Pastor if they can come back tomorrow on another issue. Then I think they decide on Monday, the 19th. Also on Monday they will discuss any issues concerning Dr. Pustilnick. 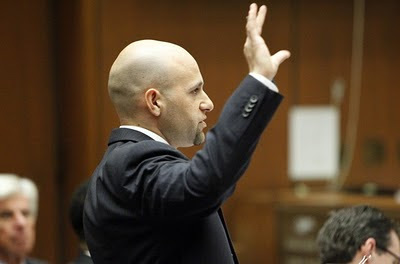 Issues concerning Karen Faye's testimony need to be gone over, and Tim Lopez's testimony. Apparently, Lopez left the country and it's not clear if the prosecution will have to write a motion to introduce his testimony from the preliminary hearing via reading it into the record, or if he will be back in the US and take the stand. There's also a Dr. Schafer the prosecution wants to call and the defense wants to block him from testifying. Judge Pastor instructs the defense to have Dr. Murray here on Wednesday, the 21st at 2 pm for Jury questionnaire cause issues and voir dire will start at 8:00 am on June 23rd. I can't remember if it was the prosecution or not, but one side was questioning the 8:00 am start time, and Judge Pastor was firm on that time since the jurors were ordered to be back at that time. I really didn't learn much at the hearing and besides, the MSM has kept up with every detail of this case. The only thing that surprised me was how Judge Pastor pronounced Gourjian's name. It's totally different than how I was sounding it out in my head. Anyway, the real reason I stopped by was to hopefully inquire with Mavis Theodorou, Judge Pastor's long-time court reporter about getting a copy of a transcript for a day or two of an old trial. She was so generous and kind in helping me make my first purchase of a trial transcript. When I get up on the 9th floor, I see Jason, the jury foreman and one of the female jurors and a male friend. The female juror tells me she wanted to contact me about my blog because she is writing a book. I tell her that all of my content is copyrighted. She say’s she’s not going to quote anything verbatim. Then I see Marjorie from the Ventura County Star and I sit to chat with her and find out what she’s been covering. Unfortunately, she will not be covering the trial of the three co-defendants. Pat Kelly and Arlene for the Public Information Office arrive. Before we even get inside 109, the Bailiff, Shawn (sp?) tells us it’s not happening today. Lori the court clerk emerges from the bathroom. Several sheriff’s arrive. There is a camera man with large video equipment. Alan Jackson shows up. Alan introduces himself to to the new bailiff’s and there’s a bit of conversation among them. Eric Harmon apparently is late. Alan Jackson jokingly says, “When he gets here tell him he’s fired”. Locat TV Station KTLA shows up and the camera man sets up in the jury box. Eric Harmon has arrived and is with AJ at the clerks desk. A Dateline producer is here. THe one dark haired woman whom I never met. A few more people show up, casually dressed. They have lanyards around their necks so they are most likely reporters. Marjorie and I are set up in the far right corner of the gallery on our laptops. Pat Kelly has given Marjorie a copy of one of the defense motions. James Fayed, case # BA346352. On September 12th, the defense filed a motion for new trial. When Marjorie is finished taking her notes from the motion, I try to type what I’m reading as fast as I can. “The court should not impose the death penalty in this case because the mitigating factors outweigh the aggravating factors. James Fayed had no criminal record before this case. He was not the actual killer; his life was one of law abiding productive contribution to society; prior to the Fayeds’ bitter divorce, the family had been happy, and Jim Fayed was by the account of none other than Desiree Goudie a good father and good family man; the jury heard from long long time friends and colleagues of Mr. Fayed that they would be deeply hurt by Mr. Fayed’s death, that Mr. Fayed’s life was worth sparing, and that they could not connect the man they knew with the man who’d been convicted of murder. the penalty phase in this case took two court day to try and a day to argue; they jury deliberated penalty for five days. This fact alone shows that the present case is not “open and shut,” or so unassailably and deservedly a death penalty case that a jury did not even wrestle with what to do; clearly the jury did wrestle ever earnestly, for days longer than it took to try (the case? cause?). The second reason the court should modify the verdict and impose LWOP is that the death penalty in California is unconstitutional, and Mr. Fayed should not be subjected to it. California’s death penalty violates the federal constitution’s fifth, sixth, eighth and fourteenth amendment and the corresponding sections of the California Constitution. Although the California Supreme Court has upheld the death penalty against the challenges listed below, the Supreme Court is simply wrong. The challenges are meritorious and should the law change in the future and the Supreme Court come to see the error of it’s ways, defendant Fayed submits the following argument as to the unconstitutionally of the death penalty in this state. The breadth of the circumstance of the crime “ aggravating factor (Factor A of Penal code 190:3 results in arbitrary and capricious application of the death penalty. Over ruled by People v Smith (2005 35 cal . 4th 334). The law unconstitutionally (?) excuses jurors from finding beyond a reasonable doubt that a particular factor in aggravation exists, that the aggravating factors outweigh the mitigation factors and that death is the appropriate (?) penalty. Over ruled by People v. Burgener (?) (snip). The law unconstitutionally excuses jurors from making written jury findings or achieving unanimity (?) as to the aggravating factors. Prosecutorial discretion to determine which defendants merit the death penalty renders the statutory scheme invalid. The jury should not be allowed to consider the unadjudicated criminal conduct in fixing the penalty. The law unconstitutionally fails to require intercase proportionality be considered by juries and judges. The law fails to require “intercase” proportionality be considered by juries and judges. Here, Mr. Fayed’s culpability should be weighed against that of his co-conspirators, and the fact that all of the co-conspirators are facing only LWOP, while Mr. Fayed’s was a capital prosecution, should have been admissible and considerable by the jury. The above is "not" the full motion, but all that I could copy before the hearing started. 9:31 am: James Fayed is brought into the courtroom. He’s in an orange jumpsuit. Judge Kennedy takes the bench. Eric Harmon and Alan Jackson for the people.” (snip) Now (the) mater is on calendar for sentencing and motion for reduction (in sentencing). I understand that neither side (is ready)? There is a motion for a new trial and motion to modify the verdict. JK? : Counsel joining in requesting us have a hearing on it? (?) I would be ready to go except everyone needs time. JK: Mr. Harmon or Mr. Jackson? AJ: We agree. (snip) We need a little bit more time to respond to the two motions. JK: (sounding a bit perturbed) I want to remind both sides to your obligation to the record. Within 15 days of receiving (the verdict) trial counsel must file corrections or directs stating... (they agree with the court reporter’s record or they are making recommendations to amend it). (snip) Neither side has done any of those things. JK: (snip) I want to emphasize how important that it is for attorneys to go thought the transcript. (snip) The record of this trial, con(versely?) could be dissected over the next 25 or 30 years. Having experts (?) of other cases, and thats assuming that’s a death penalty, but we have to proceed as if that’s whats going to happen in that. JK: Appeal courts are going to come in here and they are go to come in for a (lot? long list?) of changes to the transcript and they were not present for the trial. JK: They like to make changes to what they wish, but you are the people that were there. If you don’t take the time to go through the transcript and you’re not (going?) to have any request later on. JK: And work together for changes and the court reporter has a lot of work to do on that. And they need to be addressed by (you?) and you. AJ: We will have gone though the record by the time it comes to argue motions. (MW:?) We will have those corrections. (snip) But i will now endeavor to complete that particular requirement. There is some discussion back and forth between the judge and the prosecution as to “when” they have to be ready with their response to the defense motions. October 31st is discussed and then Judge Kennedy moves that date to October 28th. Judge Kennedy was unmoved by Jackson's assertion that he would be out of the country until mid-October. The issue is that the defense has to have their rebuttal motion argument to the prosecution’s, ten days after that, and the court needs to have time to read all motions. That’s why the date is changed to October 28th. The defense response is due November 9th. The date both sides will be ready for oral argument is November 17th. Judge Kennedy asks Fayed if he is willing to have the sentencing continue until November 17th. I don’t hear him but he obviously agrees. And that’s it. 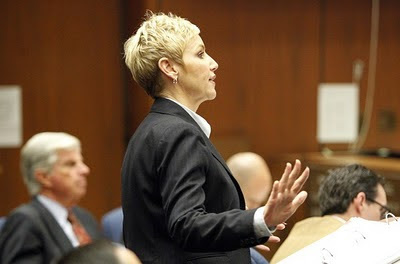 Guest Blogger KZ, a CRNA, offers her opinion on why we should care about the Conrad Murray case. The following entry is copyrighted by T&T. Please contact T&T for permission to reproduce on any web site or forum. Sprocket. 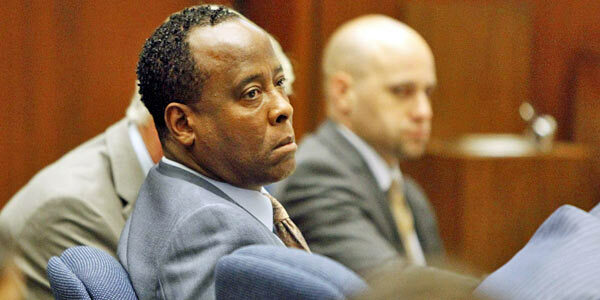 The Conrad Murray Case-- Why should we care? Just as we are all collectively recovering from the international frenzy and widespread outrage at the verdict in the Casey Anthony trial, the next "trial of the century" is poised to begin. 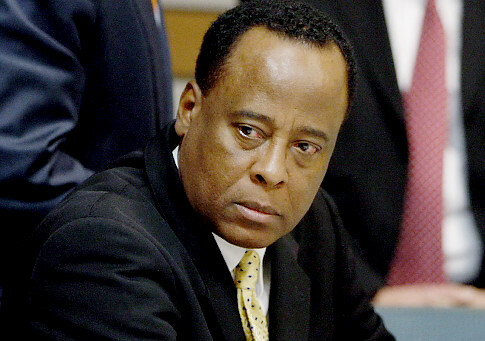 Conrad Murray is the private physician of Michael Jackson, who is charged with involuntary manslaughter in the death of the King of Pop. The trial is certain to receive widespread and nonstop coverage by the media, and will be televised according to a ruling earlier this year by Judge Michael Pastor. It is expected that many of Michael Jackson's ardent fans and supporters will have a presence in the area during the trial. 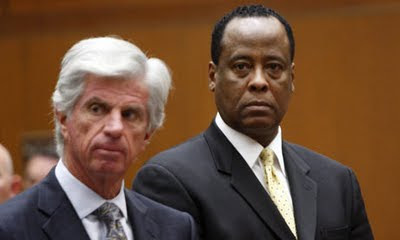 For background into what Conrad Murray is accused of doing, please refer to the 4 part series I wrote earlier this year for Trials and Tribulations. You can start reading it, HERE. So, why should we care about Conrad Murray? For the enthusiastic fans of Michael Jackson, (MJ) the answer is obvious. He is accused of causing (but not on purpose) the death of the King of Pop. But why should this case be of interest to casual fans of MJ, or those without an emotional connection to the man or his music? I believe that we all should care about the conduct and outcome of this trial, but not simply because of the superstar victim. And literally DOZENS, if not hundreds more people. You have likely never heard of a single one of the people in the above list. They were average citizens, and in some cases, such as Osvaldo Hernandez, they were illegal immigrants. But their deaths fall into the same category as Michael Jackson-- namely, they were killed by the breathtaking, reckless incompetence of a licensed physician, or someone posing as a licensed physician, either in a private home, or a "private office" clinic. That's why we should care about the Conrad Murray case. But wait! What does the deaths of illegal immigrants or average citizens have to do with Michael Jackson, the incredibly wealthy superstar musician, and his private cardiologist? It's quite simple. In every case, the physician involved was practicing as a "lone wolf", not affiliated with hospitals, legitimate clinics, or involved in any way with mainstream medicine. None of these physicians accepted insurance payments, or medicare or medicaid for their services. They all hung out a shingle asking for "cash on the barrel head." Cash only business. None were credentialed in any legitimate facilities to perform the surgeries or services that they used to kill their patients. And yes, I use the word "kill" intentionally. For the individuals POSING as legitimate, licensed physicians, they were able to do this because of the laws which allow REAL physicians to do this. It becomes confusing for patients (customers) to determine who is a real doctor, allowed to do liposuction in a hotel room, from someone posing as a physician, doing liposuction in a hotel room. Once a person (rich or poor) decides to seek out a "lone wolf" physician, every single safety net provided by legitimate, mainstream medical care is gone. The transaction becomes a fee for service, based only on whatever the two parties agree to. People who are determined to have care from these individuals generally aren't overly concerned with doing a lot of investigation of the provider's credentials, licensing and inspection of the facilities, periodic maintenance and calibration of equipment, etc. They accept the M.D. as the ultimate safety credential, and don't question much further. Now KZ, a cash only business isn't illegal. No, it isn't. And small business entrepreneurs are what our country's economy was founded on, so this is an American economic value. But, in my strong opinion, it is a very bad thing for safe medical care. Lone wolf physicians target vulnerable populations in order to sell their trade. And vulnerable populations who seek care from these individuals are typically either VERY poor......or VERY rich....or vulnerable due to a devastating diagnosis not amenable to mainstream medical therapies. The very poor, like Osvaldo Hernandez, who was undocumented, seek needed care in the shadows of the legitimate medical system. They do not want to become known to immigration authorities. You can read about Osvaldo Hernandez' horrifying death, and about his lone wolf neighborhood surgeon, Roberto Bonilla, here. Other ordinary people seek out lone wolf doctors to perform cosmetic surgeries at "bargain" prices, in offices or converted homes. There are numerous stories of the deaths of patients who underwent shoddy surgeries under substandard conditions, in hotel rooms, rented storefronts, and private offices. Notably, California and Florida, and a few other states have become alarmed at the reports of healthy people dying under these circumstances, and have moved to enact laws aimed at deterring these surgeries in these environments. But deterring doesn't mean prohibiting. Roberto Bonilla was fully aware of the California requirements for general anesthesia, and flagrantly decided to "appear" to comply with those requirements by attempting the complex surgery under "local" anesthesia. Apparently he did this a number of times without severe complications. But that trick was guaranteed to come back to create a disaster. It was only a matter of time, but Bonilla's arrogance would not allow him to consider the possibility of local anesthetic overdose. Success so emboldened Bonilla, that he just kept pushing the envelope, until he killed Hernandez with a local anesthetic overdose. True, I must agree with Bonilla that by the time Hernandez was in full cardiac arrest, there was an overwhelming possibility he would die regardless of whether advanced measures were implemented. But Bonilla, in his arrogance, either didn't know what simpler measures to try (such as high dose intralipid rescue), and clearly never thought that the hospital a few blocks away would be able to help him problem solve what was going on. Or maybe he just wanted to keep the whole situation quiet. But I digress. Let's get back to Conrad Murray and Michael Jackson. But wait, KZ. How can the VERY rich be "vulnerable"? After all, they can afford the very best of the best medical care, right? Sure they can. But the very rich (and famous) have privacy concerns that you and I don't have. And the very rich have definite ideas about a lot of things in their lives. Extreme wealth provides options and opportunities that less wealthy people don't have access to. For some very wealthy people, they want, what they want, when they want it. And there are definitely people and doctors willing to provide what they want, for a price. And the M.D. credential insulates the activity from scrutiny. After all, anything a licensed doctor does in the care of his patients is assumed to be without malice, right? No malice, no murder charge, as long as the death occurred during care provided in the context of the doctor-patient relationship. As long as a doctor doesn't MEAN to kill a patient, there was never any malice. But wait! Second degree murder can also be charged if an action was sufficiently reckless that the accused should KNOW that death can be an outcome. Well, there can be no doubt that Conrad Murray knew he was administering propofol to Jackson, in a bedroom, in a private home, with substandard monitoring. So that's reckless, right? Well, it would be if you or I did that. But it IS NOT sufficiently reckless because Murray DID NOT THINK IT WAS POSSIBLE TO KILL JACKSON BECAUSE HE IS A DOCTOR AND CAN HANDLE THE SITUATION. He didn't mean to kill Jackson.That is the argument for involuntary manslaughter, with its pitiful 4 year sentence. Prosecutors have tried in various locations to "win" with second degree charges against doctors, with very unpredictable track records. Involuntary manslaughter is easier to "win" than second degree charges. But wait! Gifted with the prospect of only 4 years if convicted, Murray pushes back even harder, and tries to make the dead musician responsible for his own death!! That is such unimaginable, jaw dropping hubris that I almost can't finish this article. Basically, what Murray wants us all to agree is that it was perfectly OKAY for him to provide the propofol and other drugs, to start the IV, to hang the drip (and yes, it WAS a drip, imo), and then absolve himself of any responsibility when things went horribly MORE wrong. Really?? Is anyone buying this, other than Murray and his attorney? Well.....it WAS perfectly legal for Murray to buy 4 gallons of propofol, ship it to his girlfriends apartment in another state, and cart it into the mansion. Was it okay? Was it medically legitimate care, with outcome based evidence, and well documented in the literature? No. Was it even slightly documented in the literature as a valid technique or therapy for insomnia? No. Was it reckless? Yes. YES. Holy crap, yes it was reckless. SO reckless, that in my opinion, it was criminal. Involuntary?? Hell no. I believe the case is sorely undercharged, but I also believe that prosecutors would not be able to get a conviction on second degree. That is the conundrum. Conrad Murray, in my opinion, was lured into Michael Jackson's exclusive circle of people as one who Jackson perceived as willing to provide him with what he wanted. Namely, propofol and other prescription substances, under the thinly disguised veil of "legitimate" medical care. Legitimate, because it was a licensed doctor (not a nurse, a technician, or a layperson) providing the substances, even though there is NO medical indication or research precedence for what Murray was doing. Had it been ANYONE other than a licensed physician providing those drugs to Jackson, under those circumstances, the criminal charges would have been AT LEAST 2nd degree murder, due to the recklessness. I do not think Conrad Murray wanted to kill Michael Jackson, or intended to kill him. But I also do not buy the argument that he was too dumb to know propofol could kill Jackson, yet so smart that he believed he could rescue Jackson from any mishap. Or wait, maybe I do. I guess that is the very definition of hubris. So maybe involuntary manslaughter IS the right charge, after all. I'd like to see Murray convicted and do his full 4 years. But it almost doesn't matter to me whether he is convicted or not. Because what we REALLY need to do, to prevent these kind of situations like Osvaldo Hernandez and Michael Jackson, is to change the laws and privileges that physicians have when working outside of valid clinics and hospitals. That, in my opinion, is what will save lives. If you can't be credentialed to perform a certain procedure in a hospital, then that physician should not legally be able to provide that service in a private home or private office/ clinic. Conrad Murray would NEVER have been allowed to provide propofol in that manner for that indication in a legitimate medical setting. That doesn't make him a visionary, or a researcher. It makes him a reckless, incompetent, arrogant man, who happened to go to medical school. Physicians, including lone wolf physicians, need to be held to the same standards as physicians who practice in legitimate settings. And the penalties should be enough to be a deterrent. 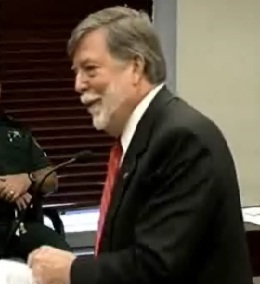 Today, Judge Perry added a total of $119,822.25 more to the amount of money Casey will have to reimburse to the OCSO. The amount represents the more detailed information provided to the judge. 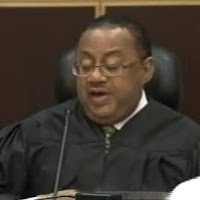 Judge Belvin Perry just handed down an Order on the money Casey Anthony will have to repay for expenses into the investigation which were caused by her lying to LE. 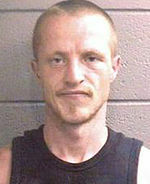 As of now, Casey will have to pay just over $97,000, with the cut-off date being September 30, 2008. In addition, Perry directed OCSO to file revised investigative cost expense reports that state the investigative work performed from July 15, 2008 through September 29, 2008 for certain employees. The revised reports are due by Monday, September 19 and the judge could amend the order and the cost could be somewhat more. The judge denied the prosecution request for their expenses other than the $50 ordered by statute. It may not be the half million asked for, but it certainly is a lot of money for a gal who has none. Google® has a new ranking system that lets readers with a Google® or Gmail account, rank websites. If you are logged into your account, up in the top right corner of the blog you should be able to see a +1 sign. Clicking on that +1 will help promote Trials & Tribulations. You have the ability to also recommend individual blog stories. Just click on the link to a specific blog entry and then press the +1. Many of you have written me, thanking me and telling me how much you appreciate T&T's in depth trial coverage. You can give T&T and all our writers a big thanks by ranking the blog and the individual trial coverage stories you like. It would help spread the word about T&T's trial coverage and reporting. Everyone here at T&T would so appreciate that. 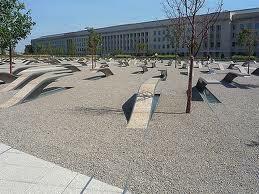 Images of the World Trade Center, Pentagon, and a field in Shanksville, PA, then and now. We're Americans. 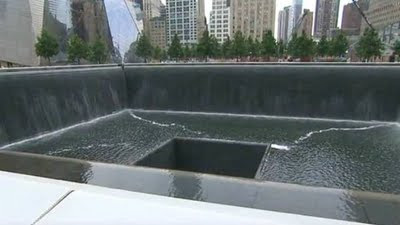 We remember and we rebuild. 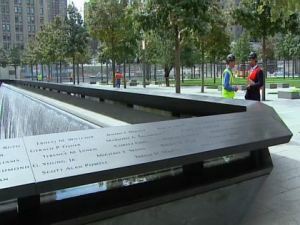 United Flight 93 Memorial isn't complete ten years later. 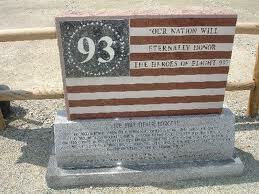 Here are temporary memorials (I believe erected at the site) to those who decided to fight back. 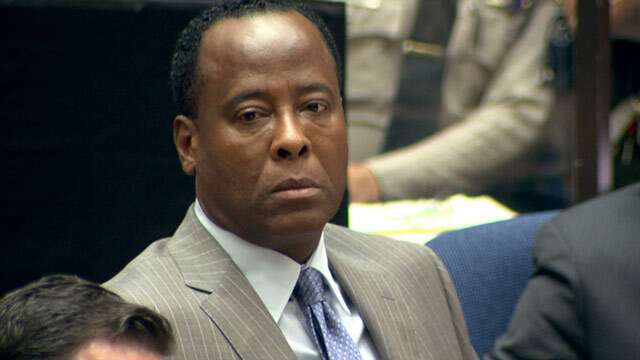 Dr. Conrad Murray, at a prior pretrial hearing. A judge presiding over the trial of Michael Jackson's doctor said Friday he expects to have enough prospective jurors to form a complete pool by the end of the day, meaning lawyers could prepare to begin the screening process to select a final panel. I've read bits and pieces around the web of the first day of jury selection. Famed journalist Linda Deutsch from the Associated Press was the lone "pool" reporter on the first day. Approximately 450 potential jurors were sent a jury summons notice. The first batch (187 according to CNN & the AP) showed up on Thursday. Another group will show up today and the last group on Monday. After jurors are excused for hardship, the remaining jurors will receive a thirty-page questionnaire to fill out that Judge Pastor has called "exhaustive." There are four public seats available and a lottery is held for those seats each day. Yesterday, In Session's Jean Casarez got into jury selection via the public lottery. Local ABC 7's Mirian Hernandez's story was the first report I read that indicated jury selection was being conducted in an assembly hall, and not Judge Pastor's courtroom, specifically. (Judge Pastor's courtroom barely holds 80 people in the gallery.) I'm not exactly sure where this assembly hall is in the Criminal Court building but I will try to find out. From my understanding, Judge Pastor was looking to obtain at least 100 pre-screened jurors to fill out the extensive questionnaire. Once those questionnaires are completed and copies provided to counsel, the most important part of the trial, voir dire, is scheduled to begin Friday, September 23rd. Voir dire will continue until 12 jurors and 6 alternates are selected. Optimistically, opening statements are tentatively scheduled to begin on Tuesday, September 27th. That's the day I expect there will be a large public showing to get into the lottery for what public seats are available. Not only will the public be vying for these seats, but those journalists that were unable to get a reserved seat will be using this avenue as well. Although I will not be attending this trial, I will try to follow it as best I can until the Lazarus case kicks off. If you have a question, please leave a comment and I will do my best to try to answer. 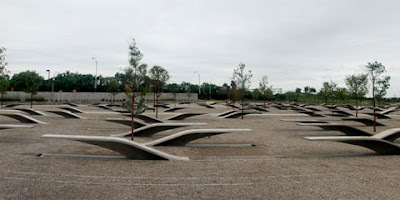 My blogging friend katfish, of katfish ponders, has been following the Sheley case ever since he was arrested July 1st, 2008 for allegedly committing eight murders in four towns in Illinois and Missouri. Shelly's first trial (there will be several) got underway on August 29th with jury selection. Although katfish did not attend the jury selection (she did keep up with the proceedings through twitter reports from the courtroom) she plans on attending the trial once opening statements kick off. You can read her latest report on Shelly's first trial on her blog, HERE. In Sessions is reporting on their Facebook page that the California Court of Appeal has just denied a defense request to stay Conrad Murray's manslaughter trial. Murray is charged with involuntary manslaughter in the death of pop icon Michael Jackson. In pretrial motions the defense team had requested that for Murray to receive a fair trial, the jury should be sequestered (a la Casey Anthony jury) to protect it from the onslaught of media coverage. Judge Pastor had previously denied that motion and the defense appealed Pastor's ruling with the Appellate Court. The trial starts tomorrow with the first phase of jury selection. From my understanding, the first questionnaire will deal with hardship issues to see if they can get a pool of jurors that can serve for the expected five weeks of trial. Once the hardship cases have been weeded out, the remaining jurors would be required to fill out a more extensive questionnaire. I decided early on that I would not try to get a reserved seat at this trial because it would be difficult to get and the fact that the trial would have cameras in the courtroom. Instead, I chose to cover the Stephanie Lazarus trial (set to begin October 17th) where cameras, laptops, blackberries and smart phones have been banned from the courtroom. Hopefully, our guest writer "KZ" will be able to contribute a story or two on the Murray case once the trial kicks off with opening statements. I thought I would get to the hearing in plenty of time but I ended up missing it altogether. The interesting news is, I learned for the first time that the prosecution plans to introduce DNA evidence collected from other items at the scene, allegedly coming from the defendant, Lazarus. Here's what happened last Thursday. I wait for Mr. Sprocket to get home so he can take me to the North Hollywood train. I'm very late, but I'm hoping there's a slim chance the hearing started late and I won't miss much of the oral arguments. I really want to hear the defense argument for the Kelly/Frye hearing. Just as I step off the elevator on the ninth floor of the Criminal Court Building I look up and directly inside the elevator car across from me I see DDA's Paul Nunez, Shannon Presby and Sherri's parents, Nels and Loretta Rassmussen heading down. I made it to the 9th floor, but I missed the hearing. I'm lucky they see me at the same time and someone holds the elevator while I sprint across the hallway to join them. I ask about the hearing as the elevator heads back down to the lobby. A few days prior, I had the rare opportunity to meet with In Sessions' Beth Karas while she was in town. (For those of you who don't know, I met Beth on the second day of opening statements in the first Phil Spector trial. She's been a friend and colleague ever since.) We caught up with each other on the cases we were covering. Beth was in town covering a Conrad Murray pretrial hearing and leaving the next day for Florida and all things Casey Anthony. I shared with Beth what I knew so far about Kelly Soo Park and Lazarus. During that short chat, it was Beth who encouraged me do the one thing I have difficulty doing, and that is to ask the attorney's directly for copies of their motions. I'm independent and don't have the financial resources of a television network or newspaper to buy every copy from the court clerk. While I waited in the lobby, reporter Matthew McGough from The Atlantic was kind enough to tell me that I didn't miss much and that the next hearing would be in two weeks on September 15th. I took the opportunity to ask him if he was working on another article, since I thought I overheard him mention something at the last pretrial hearing. He says he is working on a new story and as soon as it's up on the web I'll link to it. From my understanding, Judge Perry did not have counsel give oral arguments on their motion papers at this hearing and that's why it was so short. Once I got a chance to read the motions, I was surprised to learn that the prosecution plans to introduce other DNA evidence on items collected at the scene that allegedly can not be excluded as coming from Stephanie Lazarus. I will quote from these motions to summarize the defense motion and the prosecution's response to the defense. "...Stephanie Lazarus, through counsel, will move for a hearing concerning the admissibility of the results of DNA analyses by Serological Research Institute ("SERI") utilizing the AMpFISTR® MiniFiler™ ("MiniFiler™"). 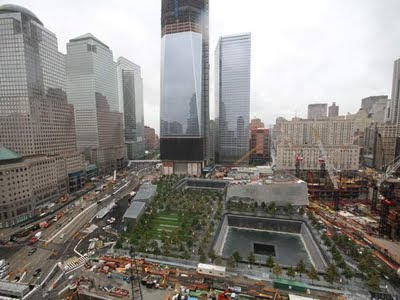 The motion will be based on the ground that SERI's DNA analysis utilizing the MiniFilter™ must first satisfy the first and third prongs for admissibility required by People v. Kelly, 17 Cal.3rd 24 (1976) and Frye v. United States, 293 F. 1013 (D.C. Cir. 1923) and their progeny. MiniFiler™ is a completely new DNA analysis commercial kit and its analytical results have never been admitted in evidence over a Kelly challenge." "The first Kelly prong provides that admissibility of expert testimony based on "a new scientific technique," requires proof of its reliability. A new scientific technique is reliable when it is "sufficiently established to have gained general acceptance in the particular field to which it belongs. Despite superficial similarity to past generation kits, there are significant analytical differences involving the use of MiniFiler™." "There is a lack of scientific acceptance of MiniFiler™ for use on low level mixed samples. Accordingly, as utilized in this case, MiniFiler™ employs a new scientific technique that requires a preliminaryshowing of the technique's general acceptance in the relevant scientific community. The third prong of Kelly requires the prosecution to establish that the analyst used "correct, scientifically approved procedures." (See People v. Venegas, 18 Cal. 4th at 80." "Even if MiniFiler™ could pass the first prong required for admissibility in this case, Kelly's third prong requires an analysis of the validity of the procedures actually utilized in the case before the Court. In order to determine whether the SERI MiniFiler™ analysis meets the third prong of Kelly, Ms. Lazarus requests that the Court issue the attached Order requiring SERI to produce its MiniFiler™ internal validation as well as SERIs most recent ASCLD-LAB audit report and its current contamination and/or corrective action log." When I first stumbled through reading all the technical information contained in the defense motion, I was wondering what other DNA samples the SERI lab could have tested that the defense is trying to get excluded through this motion. All I knew about at this time was the "bite mark swab" presented at the preliminary hearing and the DNA that allegedly matched Lazarus. Reading the prosecution's reply motion made it clear what the SERI lab had tested. INTRODUCTION On April 22, 2011, The Serological Research Institute (SERI) reported the results of their analysis conducted on various items of evidence including: (A) SERI Item 5 (LIMS 11) - a portion of a fingernail discovered near the front door of Rasmussen's home; (B) SERI Item 8 (LIMS 16) - fingernail clippings from Rasmussen taken by the coroner; and (C) SERI Item 13 (LIMS 21) - a swab taken from another fingernail discovered near the front door of Rasmussen's home. (1)"
"Those results are contained in SERI's Amended Third Analytical Report attached as Exhibit 1. (2) In short, as to SERI Item 5, SERI determined that material found under Sherri Rasmussen's fingernail could have been derived from Defendant Lazarus. SERI concluded that one woman in twenty-six thousand (26,000) unrelated individuals would exhibit this same set of DNA markers. As to SERI Item 8 (subdivided into 8-B1 and 8-B2); SERI concluded that Defendant Lazarus could have been a contributor. SERI concluded that, as to 8-B1, one woman in ten (10) unrelated individuals would exhibit this same set of DNA markers; as to 8-B2, one woman in (9) unrelated individuals would exhibit this same set of DNA markers. With respect to SERI Item 13, SERI concluded that Defendant Lazarus could have been a contributor. SERI concluded that one woman in nine thousand (9,000) unrelated individuals would exhibit this same set of DNA markers. SERI utilized the MiniFiler test kit to obtain these results." This new DNA evidence extracted from the torn fingernails found at the scene appears to be problematic for the defense because from my understanding the defense has not raised issues of possible evidence tampering with these DNA samples like the defense has with the "bite mark swab" during the preliminary hearing. On pages 3 through 5 of their motion, the prosecution argues that the MiniFiler test kit does not constitute a new technology. "4. See, Concordance Study Between the AMpF/STR MiniFiler PCR Amplification Kit and Conventional STR Typing Kits, J. Forensic Sci., July 2007 Vol 52 No 4, p 870-973 (attached as exhibit 2) finding "Full concordance between Identifiler and MiniFiler . . . in 99.7% (10,437 out of 10,464) STR allele calls compared." Id., at p 871; see also, Validation of the AMP/FSTR MiniFiler PCR Amplification Kit for Use in Forensic Casework, J. Forensic Sci., July 2007 Vol. 54 No 5, p 1046-1054 (attached as exhibit 3) finding "This study demonstrates that the MiniFiler kit is successful in generating robust and reliable DNA profiles from samples exhibiting DNA degradation or PCR inhibition. Id., at p 1054." From reading the footnote, it would appear that back in 2007, the MiniFiler test kit was validated as being a technique that is 99.7% accurate in generating DNA profiles from samples tested. The people also argued that the MiniFiler test kit was not new technology. ". . . two methodologies are widely used in forensic DNA testing: restriction fragment length polymorphism (RFLP) and PCR. (cite omitted) There are three subtypes of PCR testing: DQ-Alpha, which test a single genetic marker; Polymarker, which tests five genetic markers; and the STR, which tests three or more genetic markers. (cite omitted) The RFLP and PCR methodologies, including the PCR subtypes, have acquired general acceptance in the scientific community." We reject the argument that each new PCR/STR test kit must, as a matter of law, be subjected to a Kelly prong one analysis to determine scientific reliability. (cites omitted). The Kelly prong one analysis applies to new scientific techniques. Hill, supra, at p. 58." In their motion, prosecutors cited eight different California and Federal court appellate rulings regarding the fundamental validity that PCR and STR analysis is well established by the scientific community and the law. "...an evolution in testing does not constitute a new scientific technology for the purposes of Kelly..."
"In the present case the core technology of PCR/STR DNA testing has been firmly established and is widely accepted within the scientific community. As the court in Hill stated (discussing an earlier testing evolution of the PCR/STR technology) "The [new test kit] does not embrace new scientific techniques. To the contrary, it uses the PCR and STR testing methods, which are generally accepted by the scientific community. It is just more sophisticated because it examines a greater nuber of genetic markers. The test result will exonerate the innocent and, as here, will seal the fate of the guilty." Hill, spura, at p. 59. As in Hill, the MiniFiler test kit rests on the same underlying science as all PCR/STR DNA testing. Because the scientific technology supporting the MiniFiler test is not new, the defendant's request for a Kelly hearing should be denied." "... a foundational showing that correct scientific procedures were used." Hill, supra, at p. 58. This showing is best accomplished not in a separate Kelly hearing but by way of an Evidence code § 402 hearing preceeding the receipt of the expert testimony at trial." Judge Perry ruled just from the written motions alone, denying the defense motion for a Kelly/Frye hearing for "prong one" and "prong three" on the MiniFiler test results. 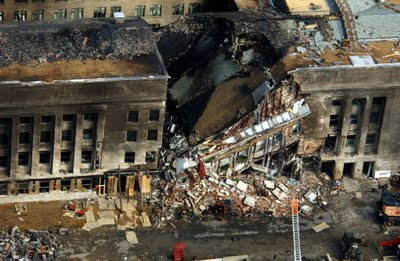 Next hearing is September 15th, 2011. I managed to watch both the Gonzalez v Anthony status hearing Thursday and yesterday's hearing concerning reimbursement to be made for the costs of investigation which directly relate to Casey Anthony's four misdemeanor charges of lying to the police. The only video available for the September 1 hearing was on InSession and I was able to see the whole hearing and analysis. Charles M. Greene, Casey's civil attorney addressed Judge Lisa Munyon concerning and number of issues. First of all, he is planning to as for a judgment of acquittal as he believes Ms. Gonzalez has no basis for her suit. He pointed out that the name is not exactly the same and that this Zenaida Gonzalez is just one of many people with that name. I seldom follow civil suits, and I don't know the merits of the case on the part of the Morgan&Morgan law firm. Some say Gonzalez has no case, others want to see her repaid for the defamation of character she claims. Mr. Greene also wanted more discovery from the plaintiff. He said that he wasn't satisfied with the information he has received to date. He specifically mentioned that he wanted to know how much money Zenaida Gonzalez received from the fund set up for her by Morgan&Morgan as it could mitigate any financial settlement should the case actually go to trial. Greene also told Judge Munyon that he needed more time to prepare for the trial (should it take place at all). The new trial date is April 9, 2012. In addition, he asked that Casey's October 8 deposition be postponed. Judge Munyon denied that request but will allow Casey to do her deposition from an unknown location. The judge also limited the deposition to two hours. Mr. Greene approved of this and indicated that, due to her appeal on the four misdemeanor conviction for lying to the police, Ms. Anthony would only give her name and take the 5th on all the other questions. John Dill, representing Ms. Gonzalez had a number of issues as well. He pointed out to the judge that the Morgan&Morgan firm had been on the case since 2008 and was ready for the original trial date in February, 2012. He also indicted that he had received no discovery from the defense. Dill would have preferred to depose Casey face-to-face, although, if she were to take the 5th, it wouldn't make much of a difference. He indicated that it would be up to Judge Munyon to rule on Casey Anthony's ability to take the 5th after the deposition. She agreed and indicated she would make the ruling either before the deposition or when the issue was brought to her after the deposition. Finally, the deposition will be sealed immediately, pending a motion by the plaintiff to have it unsealed within 30 days of the deposition. After the hearing, I watched Beth Karas on InSession discussing the civil case and Casey's appeal of her misdemeanor charges. She apparently spoke with Jose Baez who told her that the basis of the appeal (which has yet to be filed) would deal with the charging and sentencing on the charges. They are going to say that the four charges should have been one charge because all the lies were told the same day. This was also an issue mentioned during the criminal trial. If Baez were to file such a motion, it would not take into account the fact that she lied, but rather the charging and sentencing. For me, the issue will be very sticky because (surprise, surprise), the motion has yet to be filed. Until it is filed, we won't know the basis for the appeal officially. The defense could claim that whenever it is filed, it will ask for the entire verdict to be overturned. For that, we will have to wait and see what his motion says. What is the cost of lying? One true statement that Jose Baez made in the criminal trial was that Casey Anthony was raised in a family where lying was the norm. Of all the member of the family, Casey is the best liar of them all. Even Yuri Melich, John Allen, and Appy Wells couldn't get the truth about what happened to Caylee. Casey never testified at the trial, so officially, her Zanny the Nanny Took My Baby story is still her final word to law enforcement. Although it wasn't to be considered testimony, Mr. Baez' opening statement to the jury was that Caylee Anthony drowned in the family pool. That could be true, although I am pretty sure that George Anthony and Roy Kronk had no part in that. George Anthony is the worst liar in the family, it shows clearly in his tone of voice and body language, as it did when he testified at trial, in the hearings, and in his deposition to Morgan&Morgan. However, if indeed Caylee drowned in the pool, why is it still in the Anthony back yard? Why is it the Sunfire that was crushed? Think about it. For these lies, the prosecution, represented by Linda Drane Burdick and Frank George, wants Casey Anthony to reimburse the State of Florida as follows (give or take a few thousand due to errors). To bolster her figures, Linda Drane Burdick called seven witnesses who gave a brief summary of where the money was expended. There was one notable error when OCSO employee, Kari Roderick billed the state for 1,106.5 hours between the dates of July 16-21, 2008. Cheney Mason made quite a fuss about this during the morning session. He loudly expounded on the impossibility of a person working so many hours over a period of 16 days. (Mr. Mason, check YOUR math, it was a total of 6 days!) In the afternoon session, Ms. Roderick testified that the date was a typographical error. Mr. Mason pointed out that she had made the error TWICE, once in the typed date and once in a handwritten date at the bottom of the page. This is an unfortunate error, it should have been caught! Now, Judge Perry will have to over-work his calculator to be sure all the hours make sense. In her closing argument, Ms. Burdick eloquently explained why Casey Anthony should be responsible for the expenses, which include depositions and expert witness costs. For the investigation, she asked Judge Perry to use the dates of July 15, 2008-December 11, 2008, when Caylee's remains were found. There were also some investigative costs for trial preparation and investigation which occurred somewhat later than that date. Since the feed was constantly dropping, it was difficult to follow certain details, but (without watching the whole hearing again), FDLE representative Paul Zamboris indicated the direction the State was taking in asking for over half-a-million dollars. He stated that if they had known the truth from the beginning, there would have been no investigation. 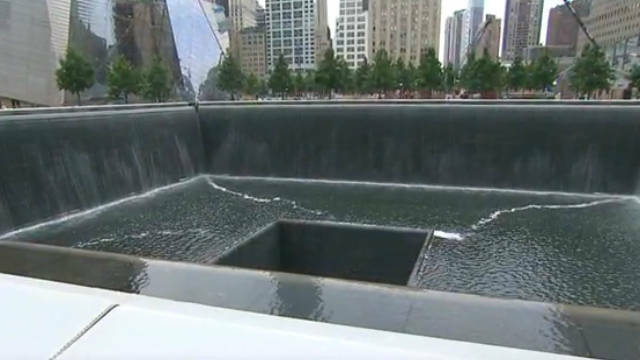 Earlier, it had been stated that the time consumed by a typical child drowning takes about 6 hours of investigation. As Ms. Burdick stated in her closing, "Once Ms. Anthony set the machinery in motion with her lies, there was no turning back on this investigation. She has yet to give any other explanation to this day other than that the nanny took the child." and, in her rebuttal argument, "But for Ms. Anthony's lying to LE at the inception of the investigation, there would be no costs for the investigation and the prosecution." Cheney Mason, of course wants to keep the reimbursement c osts to a minimum. Throughout his questioning of the witnesses, he stressed the dates when they learned the truth of the lies Casey Anthony told them, such as when they knew she was lying about working for Universal, when they knew she was lying about Sawgrass, when they learned the truth of the non-existence of outcry "witnesses" Jeffrey Michael Hopkins and Juliette Lewis, and when they knew the phone call from Caylee never took place. He seemed surprised that the people who did the collecting of data for the information did not know these details of the case. Finally, he wanted John Allen to tell him when the case changed officially from a missing child case to a homicide case. Allen gave him the date of September 30, 2008. His closing argument started out with Mason charging State's Attorney Lawson Lamar with a case of sour grapes over Casey's acquittal. He stressed that Ms. Anthony was found not guilty of murder and only found guilty of 4 misdemeanors. He excoriated the State for wanting the costs of the expert witnesses, specifically mentioning many of them, including the hydrologist (who never testified), Neil Haskell (the bug man), Dr. Michael Warren (who did his most hated exhibit, the video super-imposition), Arpad Vass, and so on. His major faux pas during his closing was to make a statement to the effect that he was sure Judge Perry's people would go over the expenses line-by-line in making the determination of costs. Perry interrupted him to point out that Mason knew he did all that HIMSELF! When he was finished, Ms. Burdick rose to his bait (She said it, I didn't.) and responded to Mr. Mason's closing. She spoke as I quoted above and said that there were no "sour grapes" over the acquittal. You can watch the entire hearing at WFTV (article) or at their links (HEARING 09/02 Part 1 | 2 | 3 | 4 | 5 | 6). Personally, if you only want to devote limited time to the endeavor, start with the closing arguments where the parties both speak eloquently to their points of view on the issue. It was clearly the most interesting part of the hearing! At the c onclusion of the hearing, Judge Perry asked both parties to submit briefs on the legislative intent of the law governing the repayment of costs. Clearly, his decision will be based not only on the law itself, which lends itself to interpretation, but also to what the legislature intended the law to encompass. At this point, Perry's jurisdiction will run out 30 days after August 11th when it will go back to the jurisdiction of the appellate court. Mason said that he wouldn't mind if Perry asked for an extension of the deadline. So, the issue comes down to, as Cheney Mason said, "It was the intent to lay at a defendant's feet solely those costs which have a reasonable relationship to what they were convicted of versus what they were NOT convicted of." 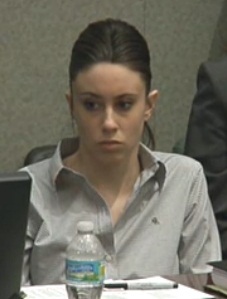 versus the State's position that but for Casey Anthony's lies, the investigation would never have taken place at all. What will Judge Perry do? I don't think the State will get all they want, but more than the defense wants Casey to pay. What do you think? Note: All quotes are approximate.